Scientists at the Lebedev Physical Institute in Moscow have modified a laser technology used in eye surgery in order to mark diamonds. It makes 3D marking possible, but causes no damage to the precious stones. Diamond marking helps detect illegal cutting and makes it easier to find stolen jewelry and gems. At the same time, it is essential that markings do not affect a gem’s aesthetic value. Our laboratory has developed and patented micro-marking methods that do not damage the diamond and are invisible to the naked eye. We create a marking in a matter of seconds by using femtosecond lasers, subjecting diamonds to brief but very powerful laser bursts. Scientists have for a long time been studying the impact that femtosecond lasers have on glass, as well as living cells. Together with experts from the Central Clinical Hospital of the Russian Academy of Sciences, we conducted research in femtosecond laser eye surgery and then carried out similar experiments with diamonds at the Smolensk Diamond Factory, 400 km to the west of Moscow. As a result, we patented two methods of femtosecond laser diamond micro-marking. They differ by laser impact, primarily its peak power. In the first one, a diamond is subjected to femtosecond laser radiation to create a higher concentration of point defects, vacancies (empty nods in the crystal lattice of a diamond), and interstitials (extra carbon atoms located in interstitial space). In the second, microscopic speckles of graphite inclusions are created inside a diamond by pin-pointing a weakening in the crystal lattice. Scientists at the Lawrence Livermore National Laboratory in the USA created a similar technology, but instead of lasers they used beams of low-energy electrons. Laser technology makes possible markings that are truly three-dimensional because the ray can easily be focused at different depths inside a diamond. 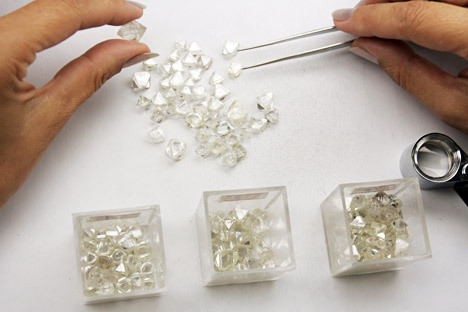 Under the first method, vacancies can be tied by nitrogen atoms that are present in diamonds in varying concentration and that form a nitrogen-vacancy center, a defect very useful for diamond marking. When exposed to visible light of a certain spectrum, NV-centers become fluorescent. After this form of micro-marking the diamond remains completely transparent. This marking can be seen only when the crystal is hit by a powerful laser in the green spectral region, and the marking starts to give off red light. The use of a femtosecond laser makes it possible to achieve a localized effect inside a diamond. The use of small aggregations of NV-centers leave a “picture” (a drawing, a bar code, a text) that will not damage the quality of the gem or its value. As a result, microscopic defects are present only inside a diamond; there are none on the surface. These defects are not more than several microns in size, which is why they are invisible to the naked eye. Under the second method, only with special lighting can the microscopic speckles of the graphite inclusions be seen. This type of laser marking cannot be removed without breaking up the crystal. For example, we made a test and engraved the Smolensk Diamond Factory's logo inside a diamond.